Boards games that focus on railways tend to come in all shapes and sizes, ranging from what are called 18XX games — generally long-winded, complex affairs which last for many hours — to simpler, faster-playing games like Ticket to Ride. Railroad Rivals is a brand-new game from Forbidden Games and veteran designer Glenn Drover. It recreates some of the complexity of an 18XX game, but with the turn speed and straightforward rules of a much lighter game. Railroad Rivals is a tile-placement, stock-acquisition and very light pick-and-up-and-deliver game, set around a very clear railroad theme. It takes place during the nineteenth century and focuses on the mass expansion of railroads across The United States. There are a number of real-life railroads featured in it, which (for the benefit of any parents out there) makes Railroad Rivals the kind of board game that provides enough actual historical detail that it will at least prompt a conversation. The game begins with the players drafting thick, chunky tiles that represent either stockholding in one of the railroads or cities. Each tile has up to four railroad monikers printed on it — one on each edge. The city tiles all represent actual US cities including Washington, St. Louis, Minnesota and of course many, many more, whilst there are also twelve railroads to draw stock in. In an unusual design decision that I really like, Railroad Rivals doesn’t include any cash transactions, which drastically reduces both component and rules fiddliness. Over the course of the game, the players expand the network of cities and railroads by placing their city tiles next to one another, matching the railroads written on the edges of each tile, then placing the wooden locomotives in their colour on these connections. In the next phase, they deliver goods to score points. A few factors can increase or decrease points as the game goes on (which I’ll explain later), but broadly speaking, the winner at the end of the game (usually about an hour after starting) is the player with the most points overall. The components in Railroad Rivals are straightforward, superbly made and very attractive, which means that a fully laid-out network looks like far more than the sum of its parts. There are five double-sided (male and female) characters printed on card that feature attractive, cartoon artwork, plus a scoreboard which also tracks stock value. All of these larger cardboard pieces are probably one to two millimetres thicker than the usual card stock you might see in another game. The city and stock tiles are just as thick and at about two inches square, they are very robust pieces — which is good, considering they will be handled often. Each city tile has a printed image of a famous building from around the turn of the twentieth century on it, plus one or more clearly marked railroad acronyms on each edge. The corners features a clearly visible number indicating how many goods should be placed on that city. The stock tiles look a little more plain at first, but that’s because each of the railroad symbols shown is an authentic reproduction of the actual symbol used by the depicted railroad — a really neat touch. There are also a host of wooden components in Railroad Rivals, including a large bag of cute locomotive pieces for each of up to five players. In the first printing I tested, there’s also a water tower and a hotel which can provide bonus points. Goods are represented by wooden cubes in four different colours and are drawn from a lovely little cloth bag with an embroidered game logo on its front. I could probably complain that the goods pieces are not sculpted, but to be honest, that would just increase production costs for no particular benefit. Railroad Rivals’ instruction booklet is succinct, which makes learning the game for the first time very straightforward. It’s unlikely you’ll need to refer back to the manual too often after a game or two, but if you do, the pertinent rules are well laid out. I was especially pleased with some of the examples provided, which in general really did help me learn the game quickly and efficiently. If you have it, a separate insert is included to explain the water tower and hotel expansion, so I just tucked it into the manual in the end. Again, only a minor criticism, but I occasionally felt as if a rule clarification (such as what happens if you can’t place a city tile legally) were a few paragraphs away from the point at which the question popped into my head. This absolutely might be my fault and I’m not sure how it will translate to other people — perhaps the advice I could give is to read the rules fully before jumping to any conclusions. In any case, the whole booklet takes ten minutes to read and this isn’t a game you’ll forget the rules to. Unlike many 18XX games that I guess it draws inspiration from, Railroad Rivals is notable for its fairness, in my opinion. Whilst there is a bidding process to let a player act first, everyone is still going to be able to draw one city tile and one stock tile on every single turn. It’s very rare that a player is unable to score on their turns, either, although determining how much you score is where the finer art of Railroad Rivals comes into its own. Whilst the first turn of each game skips the bidding-for-first-place phase (and the first player is decided randomly, with each other player receiving two point bonus over the player who will act before them), the way Railroad Rivals plays is the same for each turn of the game. First, you draw one stock and one city tile for each player (face down) and place them (face up) on the table. Players then bid to determine who will have first pick. To do this, the last player in the turn order bids first, then so on up the line of player cards — if a player does bid and is then outbid, they will have another chance to bid again. When the bidding is decided, the winning player moves to the front of the turn order and reduces their score by the amount they bid. It’s important to note that nothing else about the order changes and no one else pays — the winning player is simply plucked from the order, pushing everyone else downwards one place. Next, the players draft one tile each, then a second. Every player must take one city tile and one stock tile, so the draft order allows players to prioritise what they most want based on how badly they think others will want it. Next, players take a turn placing a city tile, again beginning with the first player. When you place a tile, you must place it with one of its edges showing a railroad acronym that matches the tile it is next to. For example, you could place a city showing the MP line on one edge with that specific edge lined up against an existing city with a free MP-line edge. 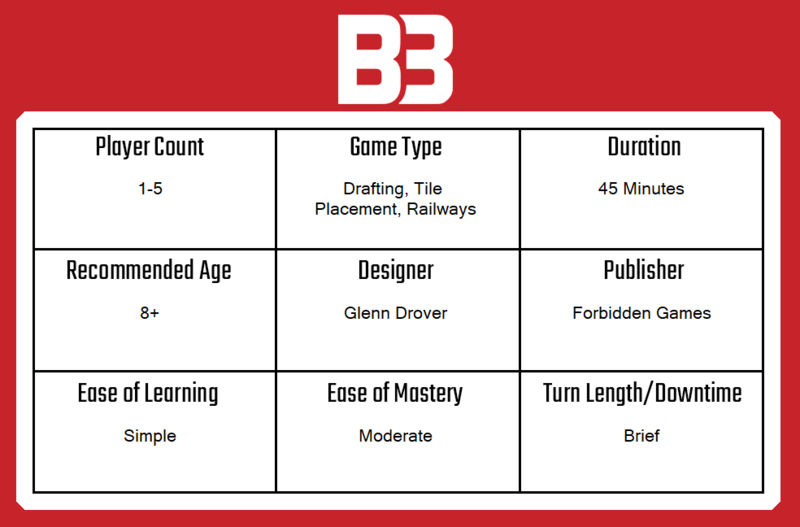 Broadly speaking, players will always have three tiles to choose from (since they begin the game with two and draft one each turn) and it’s fairly rare not to be able to make a placement. When a player makes a match, they add one of their locomotives to sit across the point where the two tiles join. Then they draw goods cubes (randomly) from the bag up to the number printed on the city, then place them on that city. Next, players simply deliver goods. This is just a case of taking one of the goods cubes from one city that you have a locomotive connection into, then ‘delivering’ it to the next. This essentially removes it from the board and lets you place it in front of you. This is important, because the first player to deliver a good of any kind will get three points, whilst the second or third player to deliver the same kind of good will only score two or one point(s) respectively. In all cases, the railroad used to deliver the good (for each one delivered) will have its stock increased by one. Typically then, each player will be aiming to deliver a good that has not been delivered before, ideally using a railroad that they have a lot of stock in. The fifth player therefore has a great disadvantage in delivering goods, since all other players will aim to move a unique cube if they can. After the cubes are scored, all of them are added back into the bag before the next round of bidding for first place begins again. There are a few other minor variant rules for playing at two players, playing with the hotel and water tower (which score points depending on deliveries that involve their cities) and when playing solo, which is a viable option in Railroad Rivals. Endgame scoring is achieved by adding the sum of your position on the points track to the the value of each of the stock tiles you hold. So, for example, if you have two NYC stock tiles and the NYC line is worth three points, you’ll score six for that line, plus whatever other stock you have, which is added to your score from delivering goods. Railroad Rivals is faster and even more exciting than the other light railroad games I’ve played and for now, at least, it has wholly replaced Ticket to Ride as my go-to game when I want a light railroad experience. It is easy to teach and has an intuitive learning curve that never layers in additional rules and unwelcome complexity — what difficult decisions there are to make and what challenging aspects players need to deal with come entirely from the strategic elements in the game, not the rules that surround them. There are three or four key things to think about when playing Railroad Rivals, which begin each turn with understanding where you want to be in the turn order. In games with less than five players, the rules stipulate that cubes of various colours should be removed, which means that the last player will always have a struggle to deliver a unique good and score maximum points. This means that competition for turn order is always strong and it can be worth spending big early in the game to get ahead — remember that with each round of betting, you’ll only ever fall back one place in the turn order and even being second or third is better than last. As the board builds out, there are various strategies for placing city tiles. You’re likely to want to focus on driving up your own stock prices, but the other players won’t idly allow that to happen. Similarly, protecting your access to varied goods is important, but players can only influence that by placing their tiles in a particular way. Add the water tower and hotel into the mix and there are actually a lot of small decisions to make that come together in a big way as the rush for points intensifies. Overall, I find playing Railroad Rivals to be very satisfying. It’s a fantastic-looking game that is very well made and, whilst it looks complex when laid out, it plays very quickly, with minimal rules overhead. Despite its inherent simplicity, Railroad Rivals features complex and challenging decisions where it counts — in the actual gameplay. It creates a few major decision points by using relatively few components (I love that bidding is done with points, not coins or some other measure) and as a result it feels like a very smart game. I highly recommend Railroad Rivals to both tabletop newcomers and experienced hands. A copy of Railroad Rivals was provided for review purposes. You can find out more about it on the website of publisher Forbidden Games. End of the line — Railroad Rivals kickstarter ends soon!